In the United States, four out of five homes are covered with asphalt shingles. These shingles are beautiful, affordable and reliable, and are constantly raising the bar in protecting your most valuable asset. “Coolness” is measured by two properties, solar reflectance (SR, or reflectivity) and thermal emittance (emissivity), or a combination of the two, called the Solar Reflectance Index (SRI). Cool roofs can also be referred to as “highly reflective roofs” and “high albedo roofs.” A cool roof reflects and emits the sun’s heat back to the sky rather than transferring it to the building below. What are the benefits of Cool Roofing? There is a great deal of information regarding cool roofing as an environmentally friendly choice. 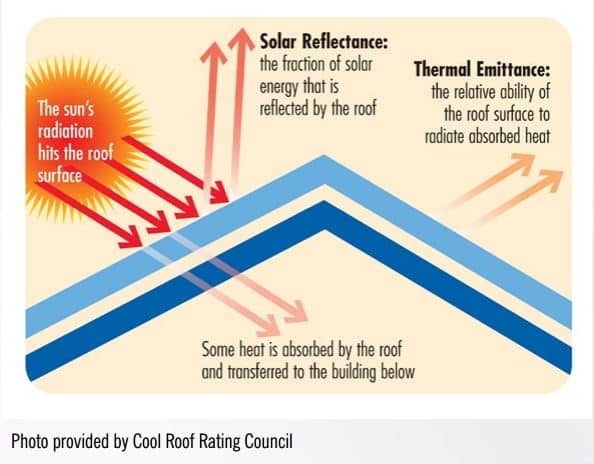 Cool roofs are an energy efficient choice that can simultaneously reduce the impact of the “Heat Island Effect,” which refers to a metropolitan area that is significantly warmer than its rural surroundings. The Energy Efficiency Discussion: Warmer climates, such as Southern California, New Mexico, Texas, Arizona, and the South East Gulf States, where the heating days exceed the cooling days, a cool roof will reduce the transfer of heat from the sun’s rays into your home or building by reflecting the heat rays back into the atmosphere, thus causing your air conditioning system to run less frequently. The Heat Island Discussion: Cooler climates, such as Chicago, New York, Baltimore, and San Francisco, the benefits of reflective roofing as a sound energy-efficient choice are specific to the particular region and its climate. Many states are instituting building code changes to require roof systems to be energy efficient. What does ARMA believe about Cool Roofs? ARMA views roof surface reflectance as only one component of the approach as an appropriate regulatory policy and design principle for energy conservation, mitigation of urban heat islands, and improved air quality. The “Whole Building Envelope” approach is the best option for designing and optimizing performance-based, proven and cost effective commercial and residential buildings. It allows flexibility and consumer choice in the selection of roof systems. What options are available to make my steep-sloped asphaltic roof more energy-efficient? With the new roofing granule technology, these shingles reflect solar energy and radiate heat far better than traditional roofing shingles. Visit CRRC and Energy Star for more information. Attic ventilation is green. A balanced ventilation system requires no energy to run and can help reduce bills and damage to your home. Be sure to ask your contractor about proper ventilation before sealing your attic structure. By adding roof insulation to your home, you will be able to save money because your furnace will no longer have to run as often, keeping your energy bills low. Although you may already have installed attic insulation, it doesn’t hurt to occasionally inspect this area. Or, try a combination of them. However, ARMA highly discourages the uses of a field-applied coating over an asphalt shingle roof. What options are available to make my low-slope residential asphalt roof more energy efficient?